Swedish melodic death metallers Arch Enemy will probably be known in the metal world by most of the people, especially after their critically acclaimed release War Eternal from 2014. In 2016, the group got the chance to headline Wacken Open Air, making it the to date biggest show in the bands history. Missed out on it? 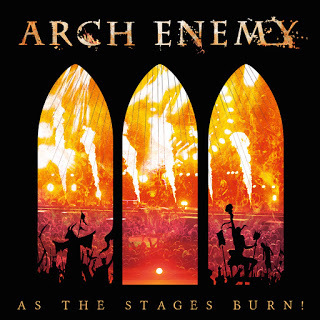 Don’t be sad, as Arch Enemy taped and released the entire concert in form of their latest live album, entitled As The Stages Burn!. A total of 16 songs are taking us through the bands history, and were chosen by bassist Sharlee D’Angelo. For starters we go back to 2011 and experience Khaos Overture and Yesterday Is Dead And Gone, the first two tracks from the album Khaos Legions. The sound has been remastered, and is now really brilliant for a live album. Next up is the title track from the latest album, and singer Alissa White-Gluz is at her best again! From now on it’s going back and forth between old and very recent material, older ones including Ravenous, Bloodstained Cross and Under Black Flags We March, and new tracks such as Stolen Life, You Will Know My Name or As The Pages Burn, the namesake of this release. The concert/album ends after 16 tracks with the classics No Gods, No Masters and Nemesis. All in all, Arch Enemy played a great gig there, which is reflected in a very nice live album. The polishing of the sound just ameliorates the listening experience, and with the awesome choice of songs no fan will be left disappointed. Grab a copy and give it a spin! 10/10.